Centrally arising squamous cell carcinoma of the airway develops in a stepwise manner from squamous metaplasia to dysplasia followed by carcinoma in situ and progressing to invasive cancer. Identification of its preinvasive precursors that predict with substantial likelihood for invasive cancer development represents important targets for detection and treatment. In fact, 5-year survival for carcinoma in situ (stage 0) is 74–91 %, which is in stark contrast to 2 % when the cancer has spread beyond the primary site. New bronchoscopy technologies that include narrow band imaging and autofluorescence bronchoscopy are developed with these objectives in mind. 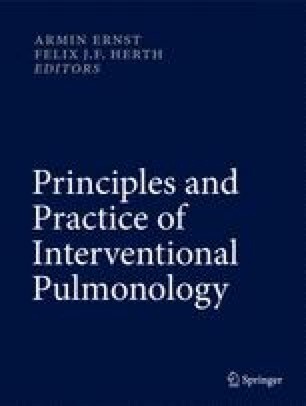 This chapter appraises the different techniques and recommends a multimodality approach toward detection and treatment of airway preneoplasia.